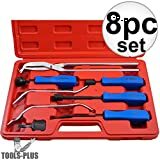 Astro Pneumatic’s professional brake tool set includes spring compressor, brake spring installer, spring removal tool, brake retaining spring tool, brake spring pliers, two brake adjustment spoons and mini brake adjustment spoon. Kit works on both disc and drum brake systems. Use to adjust clearance between drum brakes and shoe, remove and install shoe return springs and brake pads. Brake Spring Hook Brake Spring Hook Removes and installs headlight adjusting and brake springs. Removes and installs headlight adjusting and brake springs. Easy access to hard to reach areas. JQuad Automotive produces the best brake caliper hanger on the market. Made from 1/4″ powder coated steel it will not rust or corrode. The bright Safety Orange color allows for excellent visibility of our hangers so they are not left on the vehicle. Our hangers save you time again and again. Don’t let a broken brake hose ruin your day. Whether you are servicing brakes, axles, wheel bearings or suspension components you will not be let down by our hangers. Lisle dual piston brake caliper compressor compresses dual brake pistons simultaneously to make pad replacement a simple job. Squeeze the tool handle until the plunger contacts the inboard brake pad and continue to squeeze to compress both pistons. Made in the USA, Lang Tools (279) Brake Caliper Press allows you to work on various single, dual and quad piston calipers. With an extended reversing lever it allows for an easy change from spreading to retracting. The 360 degree ratchet swing gives access at any angle. Allows Technicians to Compress the Emergency Brake Cable Spring with One Hand. The OEMTools Brake Bleeder Wrench is the perfect wrench for bleeding brakes! 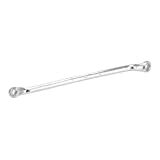 This Brake Bleeder Wrench opens and closes the brake cylinder bleeder screws to bleed the air out for complete brake adjustments. The metric two-sided tool allows easy access for 8 mm and 10 mm bleeder screws. Releases tension on both large and small GM single spring brakes during servicing. Many GM brakes use a heavy single spring. This engages the spring and quickly releases the spring tension. The brake can then be disassembled to replace brake shoes, emergency brake cable or service the brake cylinder. Also works on older C and H body vehicles with single brake spring. Smaller spring fits 1991 to current GM H body, 1992 to current GM C and H body, Bonneville, LaSabre, Buick Electra, Delta 88, Olds 88, 1995 to current Chevrolet Lumina and Monte Carlo, Cadillac Fleetwood, Cadillac DeVille, Chevrolet Lumina APV, Pontiac Trans Sports and Olds Silhouette. Larger spring fits 2005 to current Chevrolet Silverado and 2004 to current Chevrolet Colorado including 2007 models. 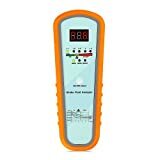 Red LED(＞4%) ON: The brake fluid performance is extremely poor, it need to be replaced immediately ! Note: after the completion of each test, please use the dry cloth or paper towel to wipe the fluid of the test point. Includes 5 adapters: 3/16″, 1/4″, 5/16″, 3/8″, and 1/2″. 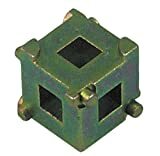 Chrome swivel, made of alloy steel reduces friction. Forged yoke made of heat-treated steel. Designed for double or single flare in copper, aluminum, soft steel brake line, and brass tubing (to 45 degrees). Housed in a blow-molded storage case. Weight: 2 pounds, 8 ounce. TEKTON 64501 Mini Tubing Cutter, 1/8-Inch – 5/8-Inch O.D. Shankly’s flaring tool kit is all inclusive, complete with double flaring capability, allowing the mechanic to focus on the job rather search for parts. Shankly’s double flaring tool set features 7 adapters sizes 3/16″,1/4″,5/16″,3/8″,7/16″,1/2″ & 5/8″ helping the mechanic complete a whole range of brake line flaring tool projects. This double flare tool kit is crafted from the sturdiest steel materials and chromed finished for easy operation and precision. This multi-purpose flaring tool has double flaring capability offering the user a wide range of utility and versatility. Shankly’s brake line flaring tool includes two bars covering 7 sizes with a self-centering, slip-on forged steel yoke to help form professional and quality flares. 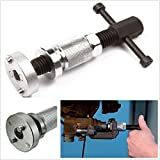 This ARES Brake Spring Compressor Tool provides you with the leverage you need to easily remove and install stubborn drum brake shoe retaining spring washers. With a comfortable handle and fluted socket for maximum grip, our brake spring tool makes it simple to remove and replace backing plate springs, cups, and pins, so you can get the job done quickly and easily. Use these chrome plated Brake Spring Pliers to easily remove and install shoe return springs on most drum brakes. Speeds star wheel adjusting. Insert tool through slot in backing plate. Different angle at each end adapts to various makes and models. Designed for import cars with brake shoe hold-down clips. Removes and installs the brake clip and nail on brake shoes in seconds. Set tool head in the brake clip groove. Push tool to depress brake clip. Turn handle to disengage clip from nail. Reverse to install. Allows technician to remove parking brake cable by compressing the spring. Supersedes part number 40800. Tool can be used when cable is still attached to parking brake assembly. Ends of tool are angled to allow easier access. Slots on each end allow tool to slip over cable instead of feeding the cable through the end of the tool. Especially useful on Ford F-Series, Expeditions, Excursions, etc. 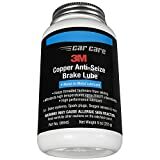 Quickly and Easily Pushes the Emergency Brake Cable Out of the Cable Connector for Rear Brake Service or Replacement. Here comes this Disc Brake Pad Calliper Tool, which is widely applied to vehicle repairing. It is made of premium steel material, with high strength and good hardness. Complete with reaction plate and reversible 3/8″ drive dual pin head. 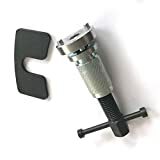 The combination rear brake tool kit is one tool the helps keep installing new DS on front and rear brakes quick and easy. .
Used to spread pads in calipers apart for reinstallation of calipers onto car.